A backstage pass to the Four Pillars distillery to see where the magic happens. You’ll get to meet Wilma, our original magnificent copper pot still, her (big) sister Jude and (little) sister Eileen. 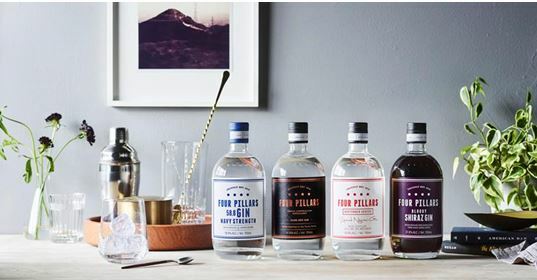 One of the Four Pillars Gin gurus will take you through the process of making a batch of Rare Dry Gin, explain how the solera system for our barrel-aging program works, what makes gin ‘Navy Strength’ and give a little bit of gin history along the way. Plus you’ll get to taste five of the gins we’ve produced since we launched in 2013: the double-double-gold-winning Rare Dry Gin, the ‘gunpowder proof’ Navy Strength Gin, the sought-after Spiced Negroni Gin, the award-winning Modern Australian Gin and always something new… They will show you how we make them and talk about how we think you should drink them. Then you can grab a drink in our bar. That’s a fun afternoon right there. Includes 90 minute ‘tour’, talk and tasting (plus a goodie bag with a bottle of Rare Dry Gin, RRP $75, a 500mL bottle of our favourite Fever-Tree Mediterranean Tonic, RRP $5, and a jar of Orange Marmalade, RRP $9).